On July 28, 2011 Health Canada has recalled the Olmitos Marine Playpen by CTTX Imports Inc. 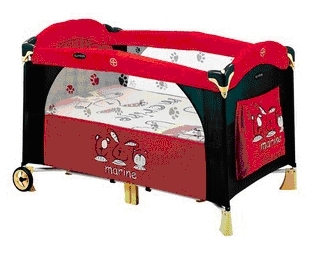 This recall involves the Olmitos Marine Playpen sold with a bassinet accessory. The accessory creates another surface approximately 30 cm from the top rail of the playpen to provide the caregiver convenient access to the child. Testing by Health Canada has revealed that the product does not meet the requirements of the Playpens Regulations and presents multiple hazards to the occupant including: entrapment, strangulation, suffocation and choking. At time of the recall neither Health Canada nor CTTX Imports Inc. has received reports of incidents or injuries related to the use of these playpens. Consumers should immediately stop using the recalled playpens. Product should not be returned to the retail store. For refund with proof of purchase and product disposal information, consumers should contact Michael Rossy Ltd or CTTX Imports Inc at 1-514-335-6255 (extension 263). Approximately 875 of the recalled were sold at Rossy retail stores in Quebec, Ontario and New Brunswick. These recalled products were sold from May 2009 to February 2011. The products were manufactured in China. The importer is CTTX Imports Inc. of St. Laurent, Quebec. The distributor is Michael Rossy Ltd. of St-Laurent, Quebec. When a company manufactures, distributes or retails a product then there will always be requirements that you meet certain quality control. Unfortunately the safety measures that are in place in Canada and the United States are not the same when a product is made outside of these countries. Product recall insurance is an important part of a business insurance policy if you sell products to the public, particularly when a product is aimed at a higher risk type of product. The quality and control must be of the highest standard when failure to do so can result in death. Your duty of care to a consumer will be considered in a courtroom and part of a lawsuit for negligence. Be sure that you have discussed your operation fully with your commercial insurance agent or broker. Turners Tips always recommends that you take control of your insurance by seeking expert advice.